It's in 3 different keys. Cool! I stumbled across that video the other day. Wow! Amazing stuff! I wish I understood it better...huhuhu! I'll just go sit in the corner with my dunce cap on for a while. "I start in the middle of a sentence & move both directions at once." I’ve been messing around with GS for years and always have fun with it. Here is one of my own personal favorite takes on it. I literally broke out my Strat for the first time in a long time to record this. Once I started playing with my thumb, like Wes Montgomery (which changes the whole dynamic of your playing on 6-string), and playing through a lot of the Jamie Abersol play-a-longs, I got fairly proficient with jazz standards - though, I would never have called myself a jazz guitarist. I had always had it drilled into my thinking that if you were going to consider yourself a jazz player, you had to be able to play the Coltrain changes - Giant Steps. I was actually pretty proficient with Monk, which (to me) is a kind of modern extension of Ellington. But when it came to the really crazy modern jazz (which, to my mind, starts with Giant Steps), I eventually found that I didn't really like it enough to warrant all the hard mental work and study of learning it - same thing with Giant Steps for me. After a few years of intermittently tinkering with it, learning the progression, I never felt too inspired to actually learn to solo through it - just didn't like it that much. I guess that I tend to be more of a melodic, than harmonic guy. Good to know I, too, can play Giant Steps. In C.
The 1st three chords, if you make the 2nd one a dominant 7th and the 3rd one a maj7, match the intro that Emmons used on Night Life. I've seen this sequence mapped out and played with different chord variations like 7ths, maj7, maj etc but never knew where it came from. I’m surprised that a video that breaks down Giant Steps doesn’t mention the Slonimsky book! This was the book that Coltrane practiced from and was the basis for the whole tune. File under: Good musicians borrow, Great musicians steel !! Awesome. Still sounds hard at that tempo. 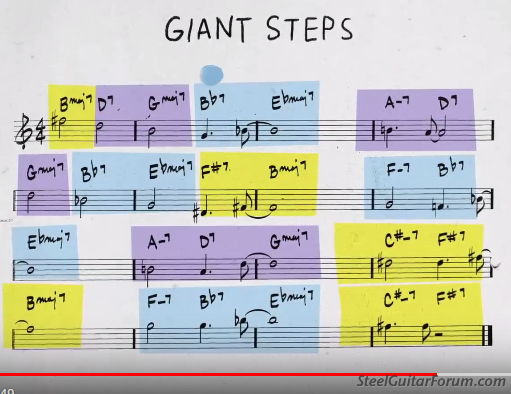 I hadn't realised that - 'Giant Steps' is a trick! Andy, thanks for posting that! I love that vid. I've been forwarding it to my musical friends as if throwing New Years confetti !